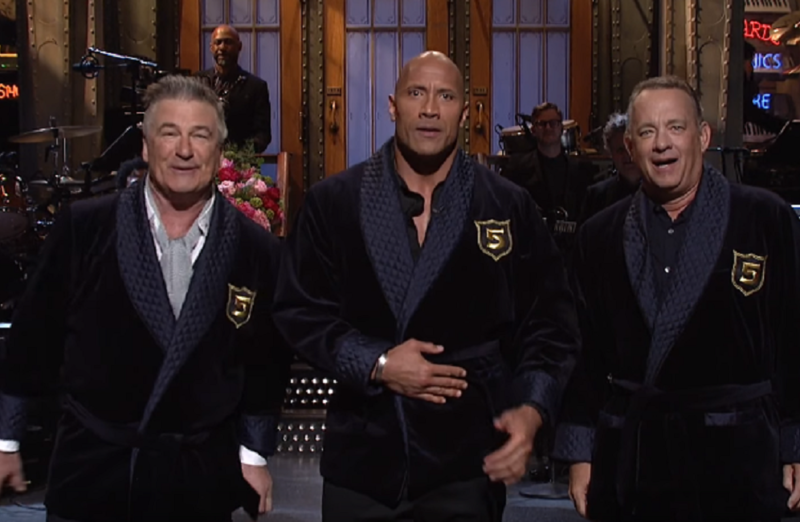 The season finale of Saturday Night Live was hosted by Dwayne Johnson, and we have some questions after his cold open. The Baywatch actor used his fifth appearance hosting the show to discuss whether or not he was going to run in the 2020 presidential race. Earlier in the week he mentioned a possible bid on the Today Show, so it’s no surprise that the topic came up again. Does Dwayne Johnson have a presidential bid cooking? After celebrating his initiation into the five-time host club Johnson made a giant announcement. "Starting tonight, I am running for the president of the United States." The announcement got even more shocking when he announced his running mate. "And I've got to tell you, I've already chosen my running mate," he continued. "He's also in the Five-Timers Club, and like me, he's very well-liked. He's charming, universally adored by pretty much every human alive." Who is this charming running mate? Tom Hanks, who also made an appearance during the monologue in the five-time host robe. The duo wasn’t serious about actually running in a couple of years (we think.) They just wanted to send an important message about the current political climate in the United States. "It's just that when it comes to politics, we need more poise and less noise," he reasoned. "Americans deserve strong, capable leaders. Leaders who care about this country and care about its people." The consensus seems to be that the pair were 100% kidding. But after what has happened in the past year, we can’t be quite sure if the Rock is entirely joking. Whatever the case may be, we hope that more celebrities and politicians follow their footsteps in calling to refocus the political landscape.